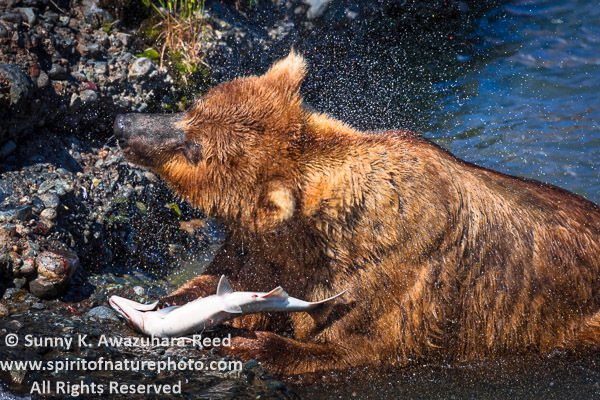 Continued from previous posting (took longer then expected...) I'm updating with new images of Alaskan brown bears. 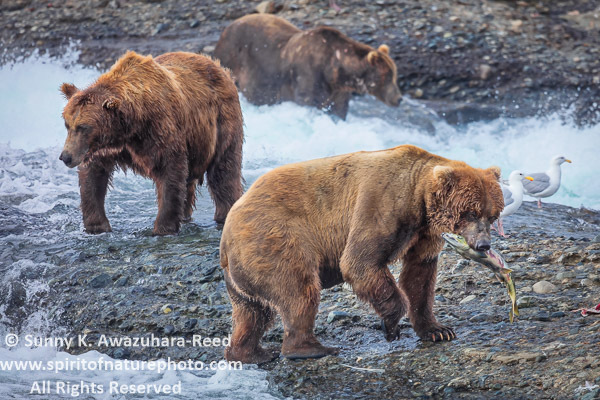 During the summer season, as the Chum Salmon run peaks, a large number of brown bears gather at the McNeil River to feast. 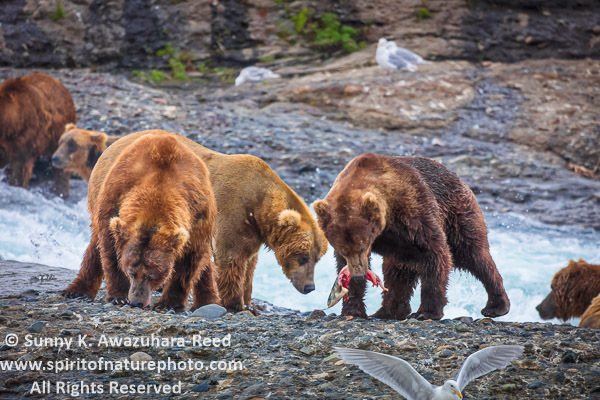 It is these calico-colored chum (or dog salmon) that attracts these bears in early July through mid-August to the remote Southwest Alaskan shore. The falls are located about a mile upstream from its mouth where a series of rocks and boulders form the McNeil River Falls. Salmon are slowed in their movements by the falls and they congregate there during their upstream migration to their spawning grounds. 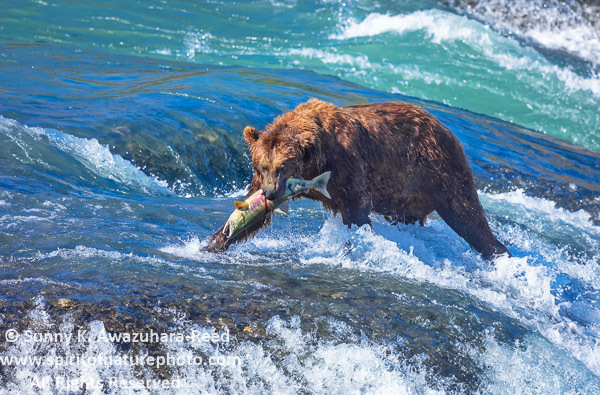 Since there are only a handful of rivers in the area with fish, bears congregate at McNeil River Falls in numbers that have brought McNeil River worldwide fame. I was fortunate enough to get a permit. The site of those large bears, some well over 1,000 pounds, at McNeil River Falls is extraordinary. 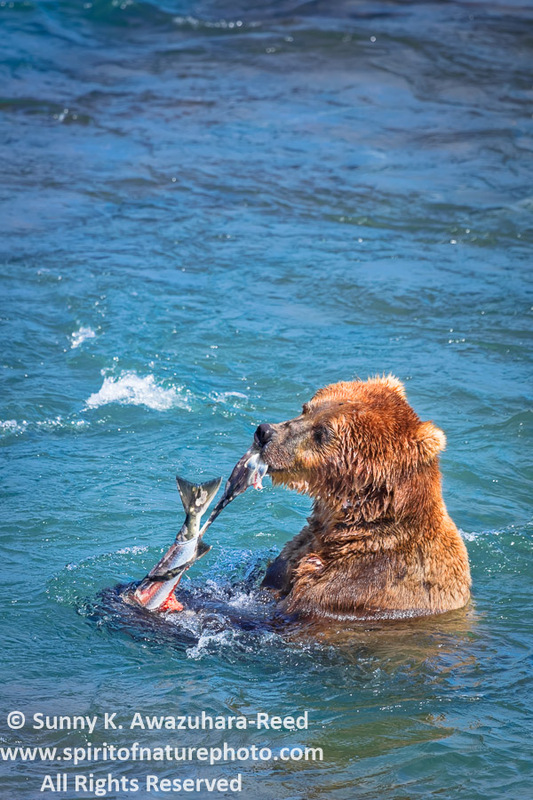 During the short salmon season, bears eat as much as 20 salmon a day to build up fat reserves for the long winter months ahead. Observing dozens of bears in close proximity with each bear having their own fishing style was obvious. 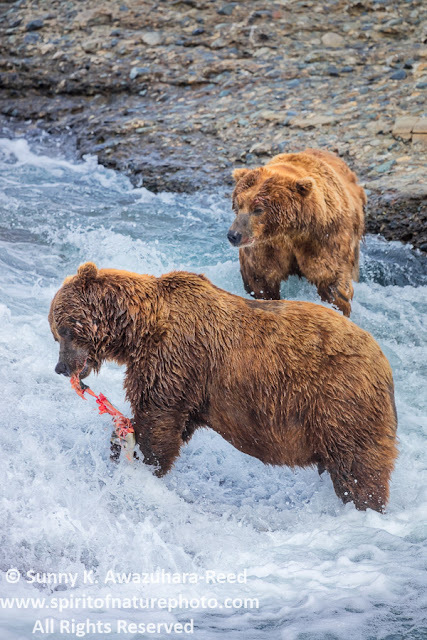 Watching the bears catching salmon in their mouths is always exciting. 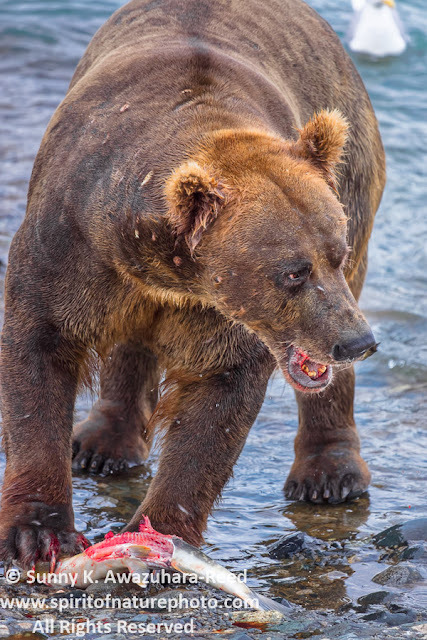 With each successful catch it was also obvious that each bear had his or her own unique eating technique. 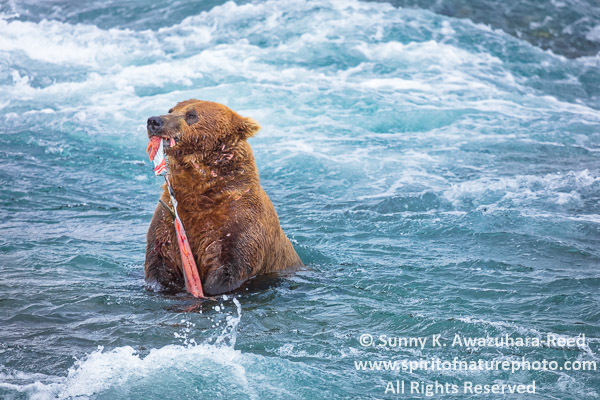 Most bears like to carry their catch to the shore to devour. 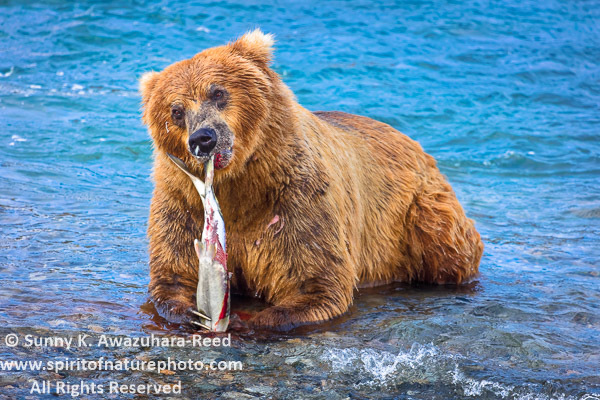 After catching his fish, this handsome bear first shook some water off, then laid down in the shallow water to eat. 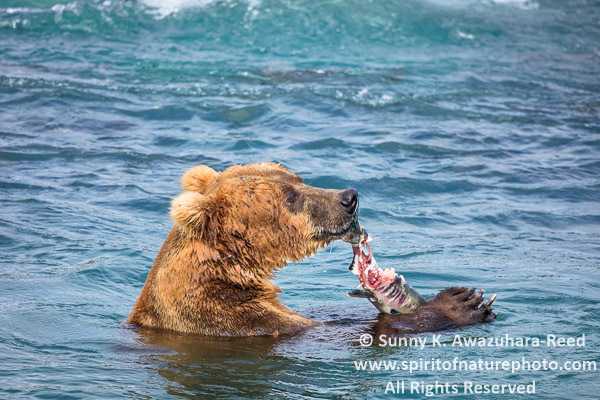 He held the fish with its craws, ripped off and ate the skin, head, then roe - the nutritious rich parts of the salmon. He was actually taking time to enjoy his precious catch. He kept coming back to eat in front of my camera! Doesn't he look like he's smiling? 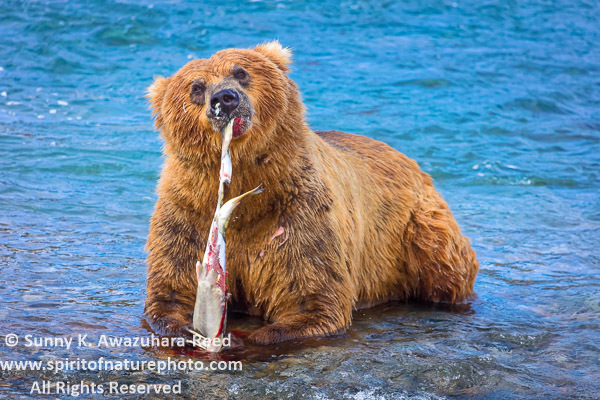 This bear reminded me of one of my signature images titled "Feast Time" from Katmai National Park from 2006. In the hot sun (Alaskan standard of course) this bear enjoyed "bathing" in calm water while casually snacking on his catch. 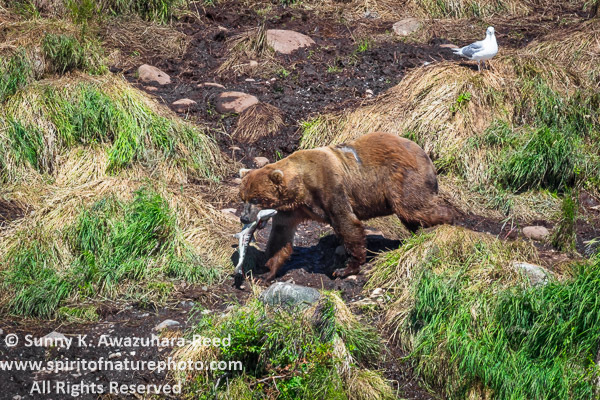 Younger or smaller bears often head off high up on the hill with their catch. Those larger dominant bears often steal meals from other weaker bears. This young bear climbs up seeking higher ground seeking sanctuary from other bears. 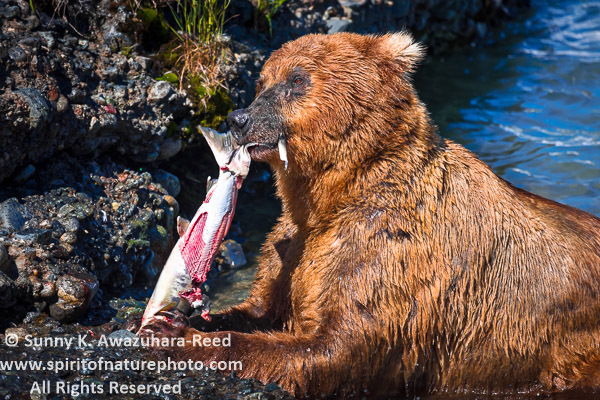 Tough bears like these large males catch his fish and eats at his fishing spot. He just stands in the rushing water, holding the flopping fish with one paw then chomps the head off for a quick bite in an artful performance. Soon after finishing his catch, he gets back to fishing, wasting no time. 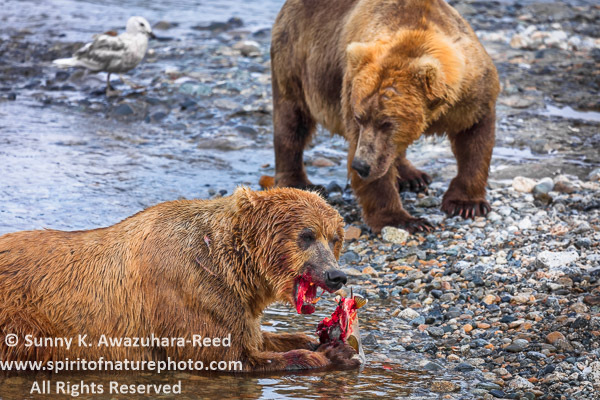 Not all bears are skillful fishers, some are "beggars" that just stare at other bears feeding, slowly crawling closer and closer for a possible morsel. This bear just ignored the beggar and kept eating... Other bears get uncomfortable being watched and move out with their fish. I was lucky to have beautiful sunshine for all four days at McNeil River Falls. The glacial water of the river was vibrant turquoise under the sun. However, the midday's harsh sunlight created shadows on the bear's eyes, and back lighting was too contrast. Overcast lighting may be better for wildlife photography. I have been spending extra hours on the computer to modify the contrast shadows. Nevertheless, capturing these special moments at McNeil River was a once- in-a-lifetime-experience. I will post more bear images on the next update, hopefully soon!